Brighton punk/riot grrrl group Pussyliquor like a good 7”, it seems. Diameter, not length: we’re talking records. Following up their debut, ‘Pussyliquor’s 7inch Wonder’, with the 3-track ‘What Of It’ EP, which is released on Revulva Records on the 14th of December 2018, they’ve made a promo video for the only song with a title fit for radio by way of a taster. Weekend Recovery are storming through 2018 with the release of their new EP ‘In The Mourning’. The EP is being released on the 27th September 2018 alongside a release show for Camden Rocks Presents on the same day followed by their home town release at The Key Club, Leeds. ‘In The Mourning’ sees the band release their most mature and personal tracks to date. The lead track has already received spins on Kerrang! Radio and Planet Rock, and it very much gets the Aural Aggro vote. 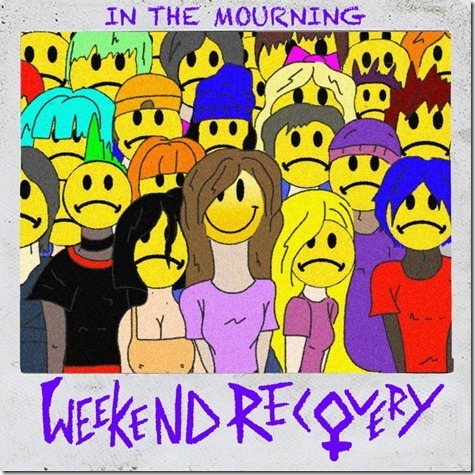 Coupled with assertive, assured and alluring performances, this EP is set to stun as Weekend Recovery keep their finger on the pulse of garage punk. Weekend Recovery formed in 2016 and have not been short of praise since. Various outlets have been quick to compliment Weekend Recovery such as BBC Introducing, NME, Music Glue and Indie Central Music. Additionally, Weekend Recovery have made appearances at NME Presents Evening whilst supporting acts such as INK. Featuringg McFly’s Dougie Poynter, Svetlanas and REWS. Following the release of In The Mourning, the band will continue on their biggest UK tour to date with over 50 dates and with more to be added in the future including Camden Rocks Festival, Tramlines Festival and Rebellion Festival.